Of all the recipes I share, this one is not the healthiest. Just whatever though, because corndogs taste amazing. (With a salad. And fruit. And digestive enzymes.) I’m providing a homemade option so that at least we’ll know these are better than store-bought. First – try to find hotdogs that are nitrite free. Also, beef. Always beef hotdogs. Fine, turkey is okay too. Just try to avoid the hotdogs that are only pretending to be meat. I can’t even believe I’m still trying to convince myself that any form of a hotdog is healthy. But for real, at least try to find some that aren’t terrible. Why I like hotdogs is beyond me. Now that we’ve covered the sacred topic of the hotdogs, allow me to share another compromise I make. This. We bought this fun corndog maker for one of our sons a few years ago as a gift because he is the ultimate corndog lover. (I have no idea where he gets this.) I think having dozens of appliances that only do one task each is fairly ridiculous. But shucks if having a corndog maker isn’t a lot of fun, so there. We’ve used it for more than just corndogs (like muffins and cookies – who knew?!) so hallelujah for an appliance that is actually multi-functional. I will tell you that this machine makes the effort of creating homemade corndogs so easy and mess free that a few days ago, I made 48 corndogs in less than an hour – while I was making tomato sauce, French toast, and frozen yogurt. The corndog maker allows me to multitask while making food for my freezer. And here you thought that appliance was pointless. 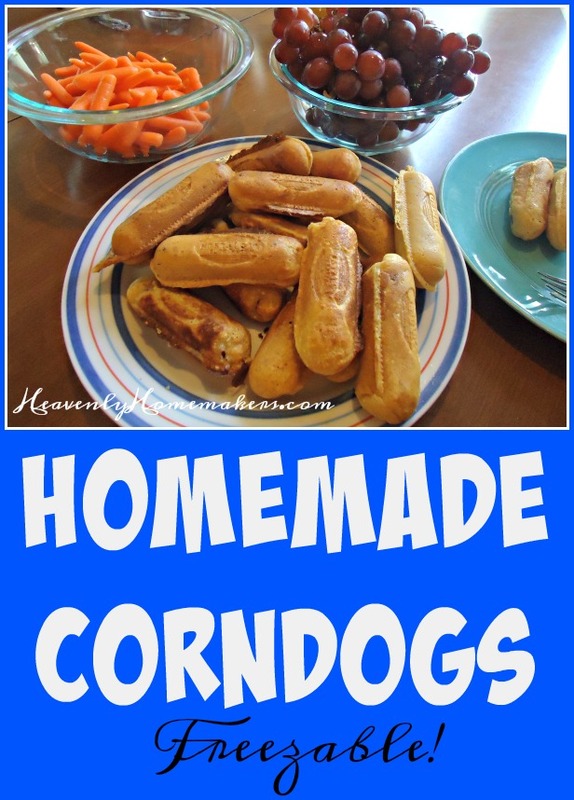 The long and short of making homemade corndogs is that you simply use your favorite cornbread recipe, add a bit of extra milk so the batter will coat the dogs, then you either fry them in oil or bake them in the above mentioned corndog maker. Life is too short to poke sticks into hotdogs. Do the stick poking if you must, but as for me and my house, we will skip the sticks and just eat the dogs. In a mixing bowl, whisk together cornbread mix, eggs, milk, and butter. If using a corndog maker, cut hotdogs in half. Dip hotdogs in batter to coat thoroughly. Serve right away, or cool and freeze in freezer bags. 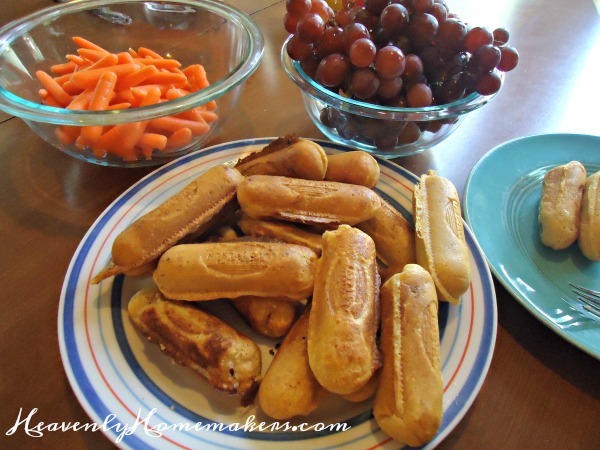 Rewarm corndogs by placing them on a baking sheet in a 350 degree oven for 10-15 minutes or until heated through. I put these homemade cornbread mixes together and have them on hand for convenience. I highly recommend this! ** I cut my hotdogs in half, then cook my corndogs in this fun Corndog Maker. It saves a lot of time and mess! If you make these to freeze, all you have to do at mealtime is pull them out and warm them up while you’re getting out all the actual nutritious parts of the meal (fruits, veggies, and more veggies with a side of another vegetable). ‘Fess up. Do ya like hotdogs? A great many studies have shown a definite correlation between hot dog consumption and increased leukemia and brain tumor risk. Eat with great caution. I live in Milwaukee WI, which was settled by German and Polish immigrants. We now also have a pretty high Latino populations so…kielbasa, liverwurst, bratwurst, chorizo, and, yes, hot dogs are all part of the culture here.v Hard to give up! I like Hebrew National which are all beef dogs, kosher & gluten free. And yes, a study was done (sorry, no source to link) that showed higher than average colon cancer rates in SE Wisconsin, which was attributed to our higher than average sausage product consumption. So there is something to be said about choosing quality sausage products in general. I actually use my corndog maker to make breakfast pigs in a blanket. I love how easy it is to take my favorite pancake batter and add a good turkey sausage and in just three minutes I have a yummy breakfast! I usually make a double or triple batch and freeze the first two-thirds before my family knows I’ve made them, otherwise there’s not many that will make it to the freezer!